As you all know by now, I went to Supercon this past weekend. Despite the crowds and spending eight hours on my feet, I really enjoyed it. I brought cash with me in case there was something in the vendor area I couldn’t live without, and as it turns out there was. I had expected booths from the comic books stores around town, collectibles dealers, and a wide variety of visual artists showing off their prowess rendering chesty barbarian women with tiny waists. I didn’t expect the authors. The first full aisle we walked down there was a writer set up with such gorgeous artwork on display for her book that I had to stop to find out what the book was about. We were early to the convention which was great because we got to spend some time milling about without the crowds. Had we seen Rachel E. Kelly and her booth a few hours later, she might not have had the free time to talk with me. Let’s talk about the book first. 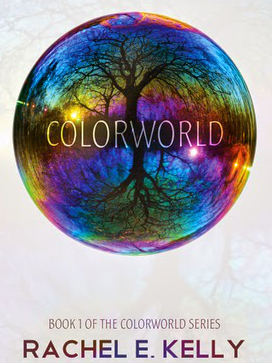 Per the author, The Colorworld Series is about a young woman who can sense emotions when she touches people. She’s also broke (author’s word). Trying to make a little extra cash, she signs up for an experimental allergy study that attempts to use energy as a form of treatment [gamma rays anyone? ], only to come out it with the ability to kill people by touch. It’s any kind of skin contact that will do the trick – no intent required – so she’s understandably upset. Book one is a quest to find out how to stop it, why it happened, and if the whos responsible intended it all along. Along the way she meets fellow Specials who were made so by the same unknown entity. I bought book one. I would have bought all three volumes she had with her, but I had brought the small backpack and I had a full day of Contastic amusements to get through. Not a problem though, Rachel gave me a coupon for free shipping if I make my next purchase through her website instead of Amazon or B&N. Book one is about 350 pages and I’m only a chapter in, but so far I like the writing style and the characters. Her writing is matter-of-fact, good dialog, and so far the character is very real world. Since I had her all to myself, I asked Rachel a bit about her writing and herself as a writer. She started writing the first book in the series in 2009. She’s a stay at home mom and had three kids when she started the project. I marveled at the presumed lack of free time with a family that size and she admitted that she often wrote late at night; staying up ’til four in the morning if the idea she was writing through compelled her. Rachel E. Kelly is self-published and has invested in not one but four editors to make sure the finished product is perfect. She markets her work by taking it on the road. Rachel, hubby, and their four children travel the Con circuit in an RV shilling the books. This really amazed me. Another thing that impressed me about this thrice-published author was the Kickstarter project she initiated to bring artwork into her novels. They hit their $20k target and she showed me samples of the new books with full-color inserts drawn by a variety of graphic artists. “If you want to finish the book you are writing, pick a date and tell everyone you know when it will be done by.” The theory being that you have to finish because you’ve committed yourself publicly. I’m really glad that kind of positive thinking worked for her. She had good energy and reminded me of other go-getter woman I have had the good fortune to encounter. Imagine the efficiency this one woman has to exact in order to write, be a mom, be a wife, publish her own books, organize the artists for her second run of press with art, and travel the country in an RV to have two booths at all the conventions. She’s my hero. I want all of you to pick a project you love, one that you know you can finish – that deserves to be finished. Then choose a completion date and share it with everyone you know on facebook, tumblr, wordpress, livejournal, at work, in the family newsletter, that aunt who spends all of her time spreading the family gossip, and anyone who lives in your house – even the animals. Commit yourself publicly, because I really want to see you hit that target. We could call it the Kelly Date. Is that too fan girl? Considering I haven’t finished reading the books, I’m more a fan of what she accomplished, so don’t think me too pathetic. I bought a few more books at Supercon, but Rachel E. Kelly is the only author I got to spend quality time talking to. I’ll tell you about the rest of my adventures at Supercon next week and then we’ll get back to Writing Humor. ***I’ve added a link to the author’s site. It can be accessed by clicking The Colorworld Series title in the body of the post. I should have done so in the first draft. I apologize for the oversight. Be sure to sign up to write with us for July week one. A few people have pre-signed up for weeks two through four as well by simply stating their intent on the initial sign-up post. We are totally cool with that 🙂 Check back in the wee hours of Sunday morning for the official Week One prompt. The whole month will be inspired by “All the small things” since July is a month-o-minis. I’m also considering giving away prizes for each week. We also have a reading list and voting poll floating around out there that requires your attention. Shane is our votes leader at the moment, but we have until quarter to midnight tomorrow to unseat him (if required). As I say often, go hit up your friends who like to read – encourage them to check out the full list and vote for those what deserve it. Be sure to weigh in on some of our other articles this week. RicoChey was talking about a different kind of color in your story world and Kathy wants to discuss how your reading tastes might skew your editing choices. Both articles are worth your time. Writer, reader, casual photographer, nature-lover, dog mom. I grew up in a tree, inside a book, whispering possible futures into discarded seed pods that curled up and exploded each summer. One day, they cut down my tree and I was forced to go to school while waiting for the replacement trees to grow strong enough to hold me. But while we waited, I grew too heavy and awkward to climb, so I had to get a job. I spent my days surrounded by flimsy walls covered in carpet that made boxes and people who forgot to look out windows. I worked really hard. Possibilities were replaced with formulas and exactitude. Eventually I forgot how to climb a tree...and how to smile. Then one day, a dog licked my foot excessively and I remembered smiling. That reminded me of more things that didn't cost money and couldn't be tallied in a spreadsheet - like hugs and love and being happy. So I found myself a Steve who reminded me what home was. Then we filled it and our hearts with dogs. Eventually we planted our own tree, together. Even though I'm happy right here, right now, I remembered that we all need possibilities to dream of, so I've started writing them down. This entry was posted in Chatter and tagged brigitsflame, Colorworld, Fiction, goals, Rachel E. Kelly, Sci-Fi, Science Fiction, Supercon, Writers, Writing About Reading, Writing About Writing, Writing Community. Bookmark the permalink. That story sounds really good. I think I’ll go check out her site! I should have included her website url in the article. Early morning; wasn’t thinking.